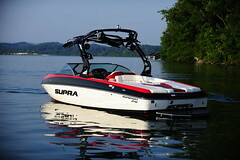 We do not measure the success of the Supra Boats @Supra_Boats brand against anyone but ourselves. We are not concerned with simply being a bit better than the next water sports boat manufacturer. Our goal is to continually improve every aspect of the boats. From interior and exterior design to ride, wake and handling performance to the team that puts it all together, Supra boats are beyond better. Buzz Brand of the Year, seven consecutive Excellence in Customer Service Awards and an Innovation Award say a lot. But we are focused beyond the recognition on a path toward refinement. There is no finish line in our minds. We are continually pushing for beyond better results and there is no better example of that drive than the new 2013 Supra Boats model line-up.